Doctor Who: Revisiting THE CHASE | Warped Factor - Words in the Key of Geek. “The chase is on,” says Dr. Moo. Doctor Who has never talked down to its audience, I’m sure you’ll agree. Sometimes this is a show that will throw comedy moments at you and sometimes it will go very dark and contemplative but usually it finds some middle-ground between the two and sets up camp there. And then you get stories like The Chase; either it’s an utter trainwreck of nothingness with no sense of direction or credibility, or it’s a total masterclass in surrealism with no stone left unturned in its quest to find the most absurd scenarios it possibly can think up. Which of these things it is is something that I’m not sure will ever be agreed upon but I think it’s probably both at once. The Chase is also the perfect example of where the show was at during The William Hartnell Years, a bunch of people who are clearly just there to enjoy themselves and end up making it up as they go along. It feels like they didn’t want to make a six-part adventure so much as a set of six standalone episodes linked vaguely by the presence of the Daleks giving chase to the Doctor and companions. 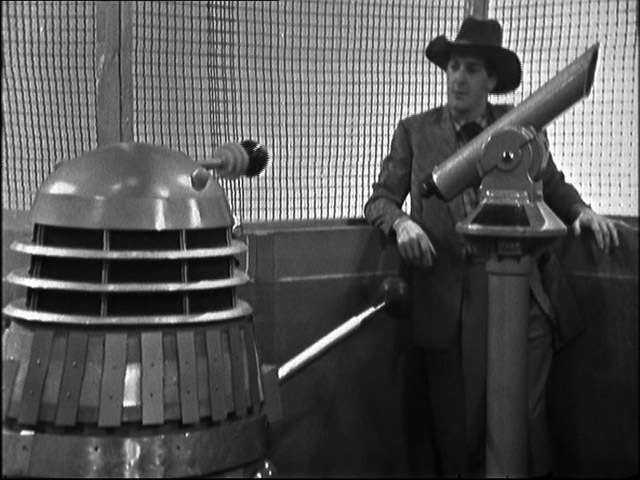 We get the Daleks on a desert planet (complete with an anachronistic Beatles cameo), we get a trip to the Empire State Building (cue stereotypical Yankie tourist played by Peter Purves), we get to see the mystery of The Mary Celeste explained (Daleks did it), we go to an amusement park Haunted House, then off to the planet Mechanus where the Doctor is temporarily replaced by a not-entirely convincing robot. All of this comes with some attempts at comedy, with the tourist (“Are you from Earth?” “No ma’am, no, I’m from Alabama!”) being the most jarring example. Peter Purves, who plays him, goes on to play astronaut Steven Taylor in the final part, and ends up becoming the next companion! What relationship there is with this character and the tourist are never explained, but I doubt anyone will complain about that. The absurdity of the situation grows more and more ridiculous as the plot, so much as there is one, progresses, leaving The Chase with wafer-thin credibility. But by the end of the story one thing has been made abundantly clear: The Daleks are relentless and unstoppable, no matter what you throw at them and how many of them you destroy they will keep on coming and continue to give chase until they have you. Which is what makes the conclusion to their part of the story so worth it. The introduction of the Mechanoids in the final episode is superb (as sixties Doctor Who monsters go that is!) as we meet some robots that are even more deadly than the Daleks and they take the Doctor, Ian, Barbara, Vicki and Steven hostage and hold them away in a cell. The arrival of the Daleks to capture the Doctor & Co is not far behind but, tellingly, it’s not thwarted by the Doctor but by the Mechanoids. 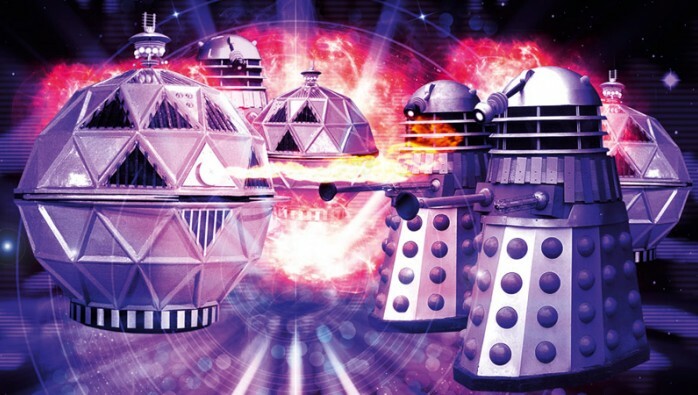 We get to see a proper Dalek Vs Non-Dalek battle sequence and it’s great. That said, all the way through the story the Daleks are utilised for comical purposes. There’s one who can’t do simple maths, one who can be clearly heard screaming as it falls off a boat, one who rises from the sand while coughing – it’s all so unashamedly childish, whether or not that’s a good thing is subject to dispute but I quite like it for being different. 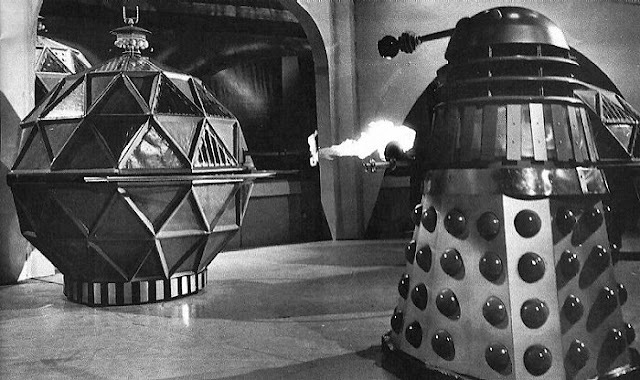 Thankfully the question of whether or not the Mechanoids have what it takes to truly defeat the Daleks is left unanswered, allowing the Daleks to retain some sense of being a genuine threat that will still give the kiddies watching some frights when they reappear. Now just imagine a Daleks Vs Mechanoids fight in the series today with a better budget – “Yes please!” say I, but I should acknowledge that I may be the only person on Earth who does. What can I say; I really enjoy the sight of some gigantic Christmas Baubles on wheels and the ethnic-cleansing Pepper Pots from space doing battle with each other! There’s just something so very Doctor Who about it that I can’t help but adore. But for all its faults-that-may-be-strengths outlined above, the story’s divisiveness ceases in the last ten minutes as Ian and Barbara get one of the best companion departures of all time. With the Daleks busy fighting the Mechanoids they have left their time machine unguarded and the two schoolteachers see an opportunity to get home. Despite the Doctor’s protests that using it will turn them into “two cinders floating around in Spain” (in one of the greatest of Hartnell’s linefluffs ever, which is really saying something) it succeeds and they arrive in London just two years after leaving. We see a touching montage of stills of them back home. William Russell and Jacqueline Hill were both amazing all the way through Doctor Who’s earliest years and a big part of its success so it’s sad to see them go. 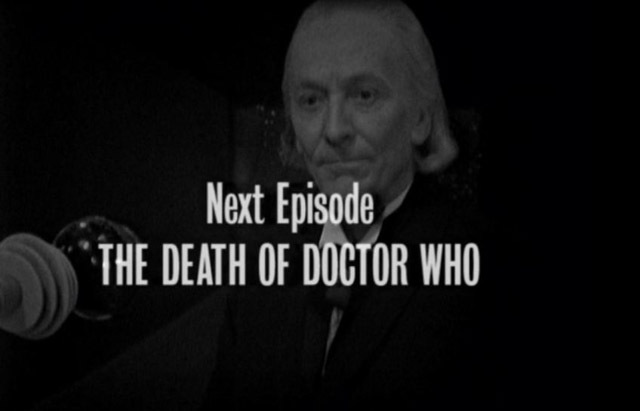 Meanwhile the Doctor laments losing all of his remaining original companions. “I shall miss them, yes I shall miss them”, he says. Hartnell’s acting here is subtle and perfect, just like it always is when he’s on form. What?! They just called him “Doctor Who”! They can’t do that!!!!!!!!!! In my speaking about The Chase you’ll have no doubt noticed that I focused almost exclusively on the final part, and that’s no accident. The fact is that the substance of the story all lies in the scenes on Mechanus and everything before it is just fluff. Whether it’s any good or not is something I can’t quite decide upon, but it’s a very different story and that certainly makes it worth watching once or twice. The Chase is the sort of story that could only ever have been made in 1965 and, whether you love it or hate it, there’ll never be another like it.